← What is PEMF? | How Does PEMF Heal? | What is The Best PEMF Device? | How Does PEMF Effect the Cells? What is Pulsed Electro Magnetic Field Therapy (PEMF)? PEMF is a therapeutic technology which is a non-contact, non-invasive, non-pharmacological and effective treatment for a variety of conditions because it promotes and maintains general cellular health and function. PEMF therapy device uses a computer/control unit to administer precise natural pulsating magnetic fields to the body (with specific frequencies and intensities) through various applicators such as a full body mat, localized pad applicators and pinpointed probes to treat specific point on the body. It is fast and easy to use for pain management and recovery from sports injuries, lower back pain, muscle aches and pains, headaches, nervous tension, and stress, improving the immune system, regulating high blood pressure and degenerative conditions related to aging. PEMF puts a healthy energy charge into the interior of the cell behind the cell membrane that raises cellular energy so the cell can heal itself faster (it increases ATP production within the cell). 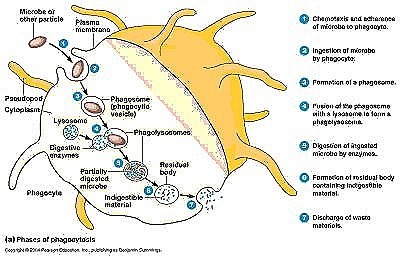 While many technologies can affect the interstitial fluids, pulsed electromagnetic fields can influence and charge the interior parts of the cell including the nucleus and the mitochondria. PEMF’s are like a spark plug or catalyst for energy production in the cell. Just like a car needs oxygen, fuel and an ignition (spark plug), so does the human cell need fuel (glucose), oxygen and a “spark plug” or ignition. This ignition is PEMF or pulsed magnetic energy. We can also think of PEMF as a battery recharger for the human cell. We now know that the voltage of a healthy cell is about 70 millivolts. When we get sick or have damaged cells, these cells have been known to operate at 30 – 15 millivolts or less in cases of cancer, or cell/body death. Pulsed electromagnetic fields (PEMF) act as a catalyst and battery re-charger for the human cells. Since everyone is unique and has different physical problems or conditions, each will experience something different. There are numerous types of therapeutic and intensity settings on the device, allowing the individual to increase or decrease its effects. Thus a person can experience many different sensations. Frequently, people will state that they feel a tingling in an area of an old or existing injury, while others say they feel a sense of wellness and relaxation. Check it out for yourself and see what you experience. Yes. Because PEMF is utilizing a magnetic field it should NOT be used on or close to any electrical devices. (i.e. pacemakers, defibrillators, cochlear hearing devices, cell phones, etc). Additionally, if you are prone to seizures, you should not use it. Neither should pregnant women or those who are currently going through radiation or chemotherapy treatment. 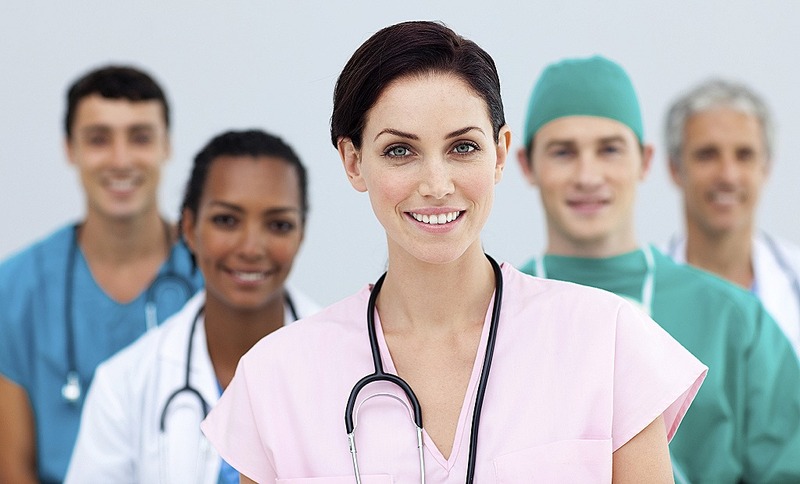 At this time, we do not have any successful reimbursements for patients. However, your doctor can write you a prescription for it and it might be covered under your HSA plan. How many sessions of PEMF will I need? How well hydrated the tissues are – Hydration refers to whether or not you have enough healthy water and electrolytes in the areas surrounding the cells. The battery ‘age’ does not necessarily refer to a person’s biological age, but rather the amount of wear and tear the cells have endured. Think about your cell phone. A cell phone with a two year old battery is not going to hold a charge as long as a phone with a new battery. However, one person’s two-year-old battery can be much more “used and abused” than another person’s. My pain is gone, am I done now? 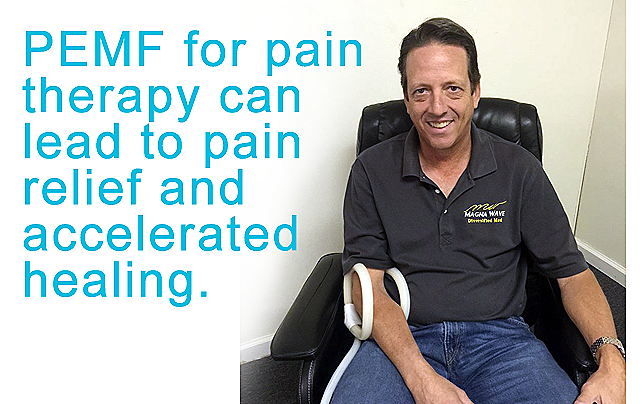 Most people notice that PEMF therapy rapidly decreases or eliminates pain. Pain is simply a signal from the body for more energy. When the workers run out of charged batteries, they aren’t able to complete their work, so it builds up. They are also sitting around with nothing to do and can become grumpy, starting to complain. When you charge their tools, the complaining stops and they go back to work. First, they have to get to the backlog of tasks that have piled up, so they need power support during this time. If you stop charging the tools before the work is completed, the complaining – i.e., the pain – will resume. Your first session is free. It is $80 thereafter. You may buy 3- or 5- packs at a discounted rate. Sessions with the PEMF unit last approximately 20 minutes though can vary depending on the patient’s needs. Are there other benefits of the PEMF Therapy? PEMF’s have also been shown to improve microcirculation, oxygenation (up to a 200% increase), help in nerve regeneration, pain management, and many other health-promoting benefits. There are over 2,000 clinical studies and over 7,000 research papers validating the therapeutic benefits of PEMFs. BY FAR THE BEST PEMF DEVICE IN THE MARKET TODAY WORLD-WIDE! 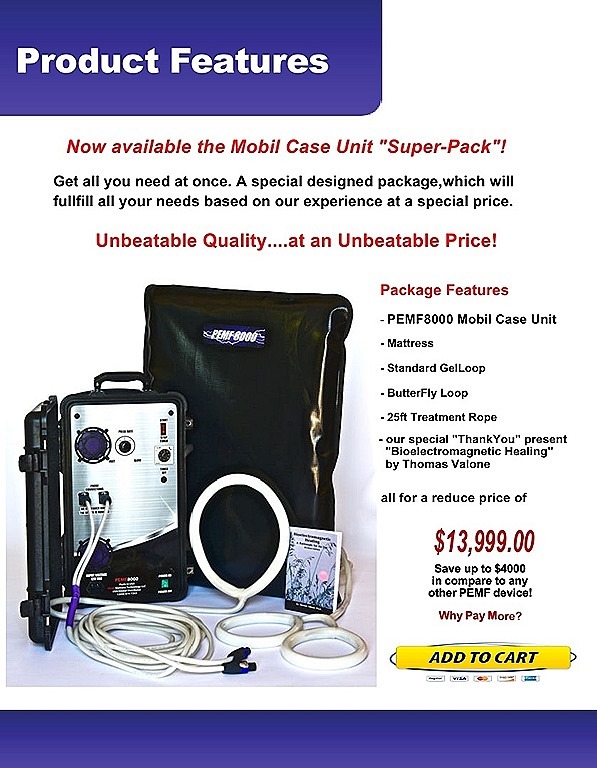 The PEMF8000 DELUXE Mobile PACKAGE! This entry was posted in #pain, #pemf, health, pemf8000 and tagged Best PEMF Machines, How do PEMF devices work Best PEMF Machines, What is Pulsed Electro Magnetic Field Therapy (PEMF). Bookmark the permalink.